It's nearly impossible for gardeners to resist the allure of heirloom plants. Their names alone sound inviting—Flanders Purple kale, Golden Marconi sweet peppers, Moon & Stars watermelons, Turk's Turban squash, Scarlet Emperor running beans, and Jefferson plums—and many growers claim that their taste is unsurpassed. Beyond the classic appeal, however, lies the far more important issue of biodiversity. Unless these unique seeds are grown and saved, they will not only be forgotten, but lost forever. 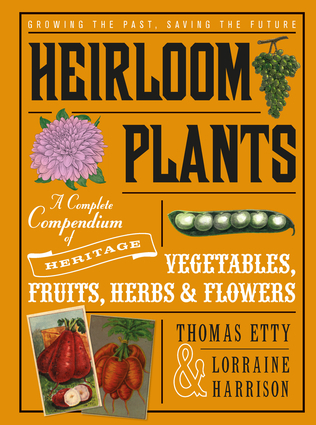 Based on the extensive seed catalogs of Thomas Etty, the popular heirloom seedsman, Heirloom Plants includes information on almost 500 exciting cultivars to be grown and harvested, along with detailed profiles and cultivation tips for each plant. In addition to edibles, the book also has chapters on antique herbs and flowers, from Cup and Saucer vines to Sweet William carnations to Empress of India nasturtiums. Trowel and book in hand, let your motto be, "Growing the past, saving the future." Thomas Etty dealt in seeds in the nineteenth century and is the namesake behind the heirloom seed company Thomas Etty Esq., created and run by dedicated seedsman and Etty's great-great-grandson, Ray Warner. Today the company dispenses seeds and expertise to home growers keen to keep heirloom varieties alive. Lorraine Harrison has a master's degree in garden history and a sizeable garden to cultivate her collection. She writes for the gardening quarterly Hortus and has authored a number of books on horticulture, including Latin for Gardeners.